We are happy to introduce our Patient of the Month, Steve Patch. Steve is a golfer who came to us after having this third Anterior Lumbar Interbody Fusion (ALIF). Steve, thank you for letting us (and everyone!) know about your experience here. We are so glad that we could help you feel better and get back to living again. OrthoCore Physical Therapy is here for you! With our locations in Westerly and North Kingstown, Rhode Island we can help you no matter where you live. Visit our website for more information and to book an appointment. So, I’ve been running more lately. To anyone reading this that knows me, knows that comes as an enormous surprise. I used to be a huge runner (3-4 times/wk) but, running and I fell out of love when I started to get injured. My knees and my back were always bothering me. I was getting tired of showing up to work and feeling worse off than my patients. Instead of working on the flexibility and strength deficits that I had, I decided to just stop running. Not exactly what I would recommend to any of my patients but, effective at eliminating my pain nonetheless. Well I’m back on the team! I credit my return to three things. 1. Like most other people who run, it’s easy to just get out of the house and run. It doesn’t require driving anywhere, or signing up with any gyms, etc to participate. 2. I can do it with my kids in a stroller. I get to spend more time with them, and it gives my wife a little break (double bonus). 3. I was intrigued when I saw that “Headspace” had a running packet. To those of you who don’t know, Headspace is a meditation app. I’ve been using it for a while now and the running specific pack piqued my interest. I was pleasantly surprised it actually made it really enjoyable to run. It didn’t feel like the mental struggle that I remember from the past. Unfortunately, with my renewed love of running, my knee and back pain returned as well. It’s like when you get back together with an old girlfriend and realize part of the reason why you broke up was her annoying best friend. Well this time the friend isn’t going to break us up again. Instead of running from my problems (see what I did there), I’m going to address them and make sure that I can keep my feet on the road. My main issue (as is the case with many runners) is that I have very tight hip flexors and IT bands. Those muscles run in the front of the hip and can restrict your hip extension and stride length. The problem with the hip flexors, and the reason why I get back pain, is that they anchor at the lumbar spine. When they are tight, your spine will flex with every stride and put excess pressure on your spine causing pain. The IT Bands run all the way down to your knee. When they are tight they will pull your knee out of alignment. That misalignment with every step will eventually lead to pain. Hence, the reason why I get knee and back pain when I run. The good news for me (and anyone reading this with similar problems) is that it’s really easy to fix. All I have to do is stretch those muscles regularly to keep my body aligned and moving properly. Here is my favorite hip flexor and IT band stretch. If you are stretching pre-run then perform 15 repetitions holding the stretch for just a couple of seconds. If you are stretching post-run then hold for 30 seconds to a minute and perform the stretch a couple of times. I hope this helps you stay flexible and keeps your feet on the pavement. If you have any questions please contact me here at OrthoCore Physical Therapy. Otherwise, HAPPY RUNNING! I know this comes as no surprise but I’ve been treating a lot of feet lately. Apparently when you open a second office with a Podiatrist that is bound to happen. A majority of feet problems that I see are due to flat feet. About 12% of the population have flat feet. That might not seem like a lot but when you consider the amount of people in the world, that’s a lot of fallen arches. Most foot problems, that are due to flat feet, stem from weakness in the arches of the feet. 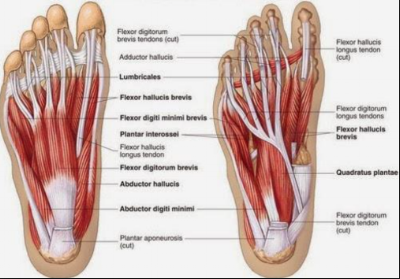 There are a group of 9 small muscles in the foot that help to create and maintain the shape of the arch. Just like any other muscle in the body, if you don’t use it you lose it. The hard part about people with flat feet is that the muscles are constantly on stretch. A muscles that is constantly stretched, is going to be weak. So you are really fighting an uphill battle. The other difficult part for most people is they don’t know how to strengthen their feet. What do you do? Put a tiny dumbbell around your toes and do curls? As much as I would love to see people try that, it wouldn’t be effective. Here is one of my favorite exercises to do to strengthen the intrinsic muscles of the foot (crazy socks not required, but recommended). If you perform this exercise regularly it will help to strengthen the foot muscles and start to build up your arch. If you have a really flat foot, I also recommend wearing a foot orthotic to give a little extra support and bring the arch up to where it belongs. I hope this helps to keep your piggies from aching and get you up and on those feet pain free. If you have any questions please contact us . Thanks for reading!